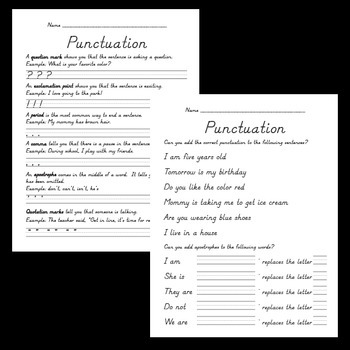 This download includes 2 punctuation worksheets. The first page defines basic punctuation and has students write the name and the symbol (question mark and ?). The second page has sample sentences where students add the punctuation and also has students practice using apostrophes (turn I am into I'm, etc). Great for introducing punctuation or reinforcing it later in the year.